Ganesha Chaturthi is the Hindu festival celebrated on the birthday of Lord Ganesha, the son of Shiva and Parvati.Ganesh Chaturthi is observed in the Hindu calendar month of Bhaadrapada, starting on the shukla chaturthi (fourth day of the waxing moon period).The festival lasts for 10 or 12 days, ending on Anant Chaturdashi. Around 3 to 4 month before, various artists satart making the Lord Ganesh statues. They are very beautifully made with clad in vivid poses by Skilled artist. Then, Ganesh Mahastov start with the installation of Lord Ganesh statues in home. We (Indian) went to market and bring them at home and then they are placed in a decorative place for around 10 to 12 days. 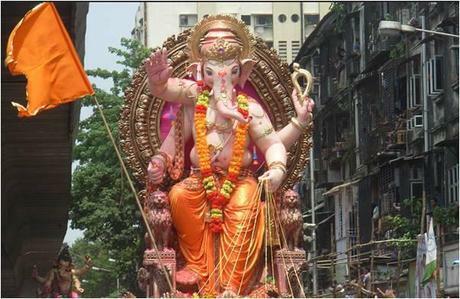 Then daily in the evening around 7 pm, lord Ganesh is being worshiped for 10 days. Then, at the end of Anant Chaturdashi Lord Ganesh is immerse in river. Immersing the statues of Ganesh made of clay make the water polluted but it is traditional running in India. However, now a day’s youngster have become more aware of water pollution and some people have started to make a small statue with clad and at the end immerse in bucket filled with water. It is believed that one who worshiped Ganeshji will be happy forever and no matter what is occasion and where it is been celebrated, it is mandatory to worshiped Lord Ganesh first. So whether it marriage,puja,occasion or you are going to start any work, then you have first work shipped Lord Ganeshji. 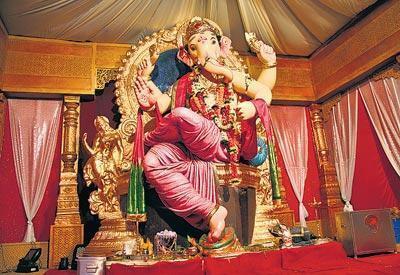 Lord Ganesh at Home for 10 to 12 days.Such a huge decoration is made for lord Ganeshji. 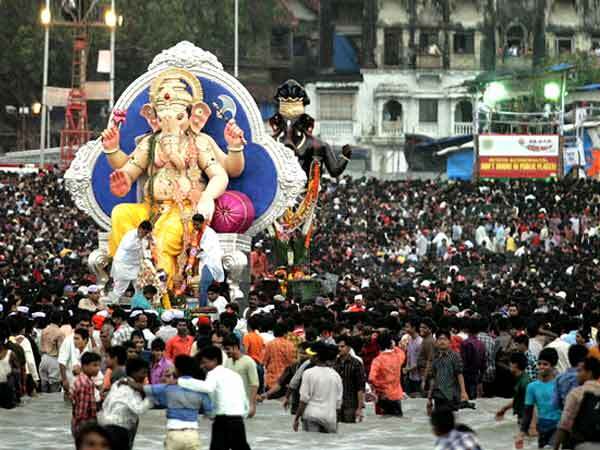 Lord Ganesh immerse in River on last date. So lets speak Ganpati bapa moray………….